10-10-07, originally uploaded by sjohnston. 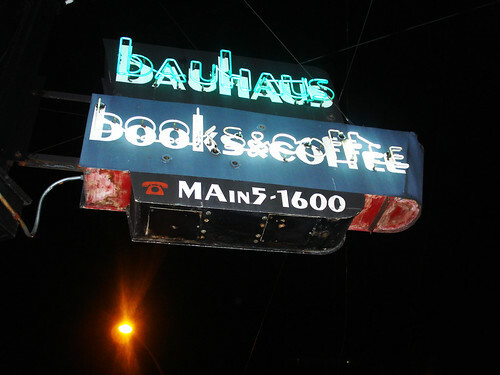 You have three more nights to enjoy a late coffee at Melrose and Pine in the original home of Bauhaus. Sunday around 1 AM, the cafe will bring its 20-year anniversary celebration to a close and prepare for its coming two-block move to make way for a massive redevelopment that will preserve, rebuild and demolish much of its E Pine block. In its place will soon rise an eight-story — some say nine — apartment building and mixed-use development slated to be completed sometime in 2015. Bauhaus has first dibs, we’re told, on the corner cafe space in the new building. Bauhaus is slated to re-open in the former Capitol Club space in early November. The two-block move is part of an exodus of small retailers from the Melrose and Pine block. Some like Wall of Sound, recently moved in at 12th and Pike, and Le Frock, now resident on E Pike, found new, nearby homes. Edie’s Shoes moved into the renovated Greenus building at 500 E Pike earlier this summer. Meanwhile, residents of the handful of units in the Pinevue Apartments have also found new homes. Below is a collection of Bauhaus pictures from the CHS archives and a timeline of the neighborhood’s big change at Melrose and Pine. Notes on Melrose & Pine | Developer’s adaptive reuse goals, seismic issues, can Bauhaus be ‘saved’?